A guide to the best things to do in Wellington for free. 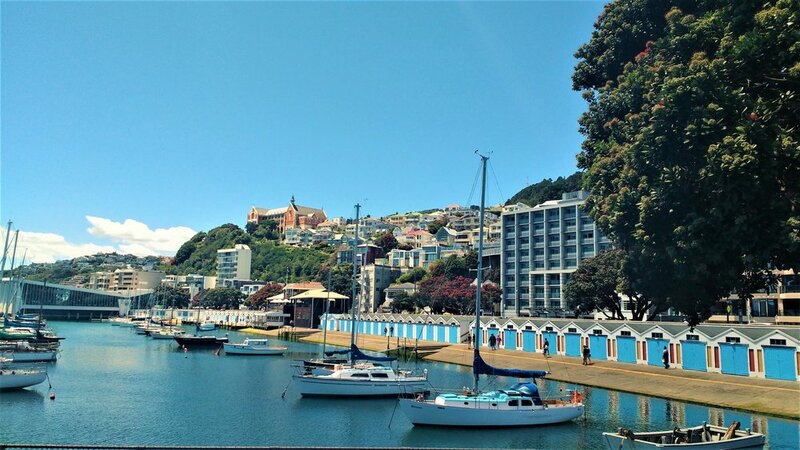 Make the most of your time even if you are visiting Wellington on a budget! As the saying goes, 'you can't beat Wellington on a good day'. And having recently experienced one of those good days I can definitely agree. This cool capital is certainly small by international standards but it packs a lot of punch. It's definitely a must-see for anyone travelling New Zealand. Price-wise this city isn't exactly a backpackers dream destination. But if you manage to catch some decent weather (or bring a warm jacket) there are plenty of awesome, free things to do in Wellington. Public transport in Wellington is decent enough but can be pretty expensive. Luckily, the central city is quite compact and lots of sights are within walking distance. As well as these free activities, it wouldn't be a trip to Wellington without a coffee stop at one of the many cafes. So make sure you save a few dollars as there are a lot worth trying. This area stretches from Oriental Bay right around to the main train station and makes for a great stroll on a nice day. The beaches at Oriental Bay are man-made but now form a popular spot for picnics, beach volleyball and brave swimmers. The pedestrianised area follows around past Te Papa towards Frank Kitts Park where you'll find a Saturday market full of local artisans selling their wares. The waterfront continues on with wide walkways ideal for cycling, rollerblading or scootering. Further on there are some restaurants and cafes as well as the ferry going to Somes Island and Days Bay, which makes an excellent (but not free) day trip. At the far end of town is the New Zealand parliament building, known as 'The Beehive' (you can see why). The building has some nice grounds and the Parliamentary Library building is worth a look too. Across the road you'll find the largest wooden building in the Southern Hemisphere, known as the old government building or the Law School (as it is currently rented by the law faculty). Visitors can enter the grounds and the first floor for free. Mount Victoria can be accessed from a variety of areas. It makes a great (and tiring) walk which will take around 30 mins through the bush. Alternatively, you can take the bus (#20 from the city centre) or drive. The view from the top is 360 degrees, looking out towards the suburbs to the south and across the harbour to the north. It also makes a pretty romantic spot at night with all the city lights. This is a must do for all movie buffs. It is located in Miramar, which is a 30 minute bus ride from the centre of town and home of Weta Workshop. The Cave is a small museum space displaying props, figurines and collectibles from films such as Lord of the Rings. There is also a documentary which is free to watch. The Cave is very small but interesting to see. I would recommend that any LOTR fans or movie enthusiasts pay for a proper tour of the full Weta Workshop. A trip to Wellington would not be complete without a wander up this iconic street. Cuba St is a pedestrianized area flanked by shops and some of the top cafes in the city. Wellington is well-known for its great coffee and this is a great place to grab a cup and engage in some quality people watching. Cuba St is also home to the famous bucket fountain which has delighted many a child and been swum in by many a drunk stag. The biggest and possibly most worthwhile free thing to do in Wellington is the National Museum. Also great for when the Wellington weather decides to play up (more often than not). There are several floors with permanent exhibitions about New Zealand animals, history and natural disasters. On every floor there is an area with hands-on activities to keep the little (and big) people busy. The shops are great for NZ gifts and books and there are paid exhibitions on a rotating basis. I would reserve at least an hour or two to wandering around and learning about NZ. Even for the non-museum types (like myself) it is engaging and interesting. If you are a museum type you can also try the Wellington Museum for interesting and interactive displays about the history of Wellington and how it has developed as a city. Or the Cable Car Museum which you can learn about Wellington's iconic, little red cable car. Both have free entry. Reachable by foot from town or by the famous cable car which departs from Lambton Quay. The gardens contain many native New Zealand plants as well as an impressive array of others. There is a rose garden with a cafe as well as a range of walking tracks, lawns for picnicking, a duck pond and playground. In the summer there are free concerts at the sound shell and sometimes outdoor movie nights. From Welly or been there? Do you know of any other great, free things to do in Wellington? For my top Wellington cafe recommendations check out my article on Two Drifters blog!